Okay WOW. My heart is literally POUNDING right now, and I swear and I pray that this is not the end of this incredible, intense, seemingly impossible (but SO AMAZINGLY POSSIBLE!!!!) love story. OH. EM. GEE. This captured me and the more it went, that harder I was hooked. I’ll admit, the minute I heard older woman/rock star, I was excited!! The ultimate fantasy come to life. But then I realized “boy band” and not ever having been into the whole boy-band thing, I shied away. I didn’t think I could relate. But boy-band lover or not, DO NOT let that stop you from immersing yourself in this one. It will take you away, in every way. And not always in the best of ways, but could we expect anything else in such a public, demanding, fantasy-life? With all odds against them? This is THAT journey and OMG what a journey it was. Is? I won’t say much more on that front. Love it or hate it, it will make you FEEL. Oh, the insistence that I read this and the recommendations were frequent and adamant, and I couldn’t resist any longer. Lee. It’s guaranteed to re – awaken all your emotions . Feels for days! …I’ll keep shouting it from the rooftops, anyone in a book funk read “The Idea of You”….leave all judgement at the door and just enjoy the ride lol!!!! Northernstar: Just finished The Idea of You and I have no words….ugh! I want more!! The writing was fantastic and the banter between Sol and Hayes was so funny. This is definitely a 5 star books and in my top of 2017. I know I’ll be thinking about this book for days to come. Susan: The Idea of You!!! I wish I could experience it for the first time all over again!! I told you!! You won’t be able to put it down. The idea of a boy band book did not appeal to me but I am so glad I did not allow that to deter me from reading it. That ending. Ugh!!! I want more so bad. Everyone has to write reviews for this book when they read it and get the word out. The author said that she had a sequel in mind but it’s up to her publisher as to whether or not it gets done depending on how well the first book does. I’m still thinking about this book!!! …Forbidden romance. Older woman, younger man/boy. This is the author’s debut novel and she hit it out of the ball park. You have to read it. You will not be disappointed. I want a second book. Traci: I read the Idea of you a couple of weeks ago. I absolutely loved it! Definitely a 5 star read. I loved Hayes. He’s my new book boyfriend. I want to read it over again. I rarely do that. I hope there are more books about the main characters and the other guys from this author. Enjoy! steph: I’m STILL thinking about it which is a rarity in my world. I loved EVERYTHING about this book. The story, the characters, the romance, the art, the language, the ending. Everything. It grated on me. That no one would question him moving on. Him marrying and impregnating someone more than ten years his junior. Because that’s what divorced men in their forties did. His stock was still rising. His power still intact. Daniel had become more desirable, and I somehow less so. As if time were paced differently for each of us. Even though, occasionally, his self-centered needs thrust her into the duty of leaving her own personal/business life aside to accompany her daughter to events he planned. Which is how she met “Hayes”. Having to accompany her daughter and friends to the biggest boy-band concert of the year (WITH backstage passes for the meet and greet) was more of an annoyance, but she stood resolutely, doing her best to temper her reaction to all of the ear-piercing squeeeees and trills of the excited girls, and rolling her eyes at the “boy band” antics. That is until one of the most popular members set his sights on her. There was something about him in that moment. His ease. His accent. His cocksure smile. Disarming. …but when he made contact a few days later with her at work, she realized she was dealing with a whole other level of interest. Hayes was into her. And Hayes was only 20. Grabbing a bite. With a twenty-year-old. From a boy band. Under what circumstance might that ever be construed as acceptable? And now the story begins. Can you imagine?? Yes. You can. And this one takes you there. Through ALL of the various incredible and incredulous moments that can happen when you’re dating one of the most famous members of a HUGELY famous boy-band. Pasts. Rumors. Paparazzi. Gossip blogs. Groupies. Rabid vicious fans. Jealousy from ALL angles. And then of course, throw in the age difference. And the fact that her daughter has NO clue what her own mother is up to (dating the very band member that she loves the most). PLEASE. PLEEEEEEEASE!!!!!!!! MORE. MORE!!!! What an acute and profound ending, and how fast and furious it came. Abrupt. Crushed me. Lindsay: just finished The Idea of You and it is fantastic. I just got the chills after reading that last sentence. Very well done. YES. Lindsay!!! It is one of THOSE!!!!! Those last lines that just ties the book together and makes it that much more incredible and intense!!!!!! D.G. The Idea of You…loved it until I hated it! Never had a book put me in a bad mood while on vacation at that! …I am still harboring ill will toward this book. Geez!!! Jan: DG I’m with you. I struggled with The Idea of You too. I know many have loved it, but it’s not for everyone. Susan: …Not sure I am happy with the way it ended because I want more!!! 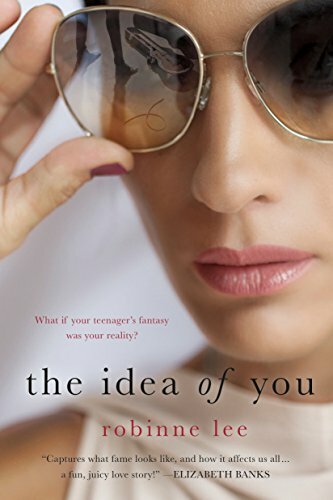 Claudia: Guys you must read The idea of you by Robinne Lee! Just finished it and couldn’t stop, had to read it straight through! Crossing fingers there is a part 2! I could not stomach the weight of that just yet. The idea that with us there could be no happy ending. 4.5 stars!!! This is EXACTLY the kind of whirlwind romance I want to indulge and lose myself in. So incredibly overwhelming, and yet I can’t get enough! So glad you finally read it and liked it Maryse. Solene and Hayes’s story is one that has stayed with me almost one year after reading it. Brilliant writing by Robinne Lee. God I loved this book so much. The writing for me was just stellar. Five plus stars for me. I found the writing and flow excellent, too!!! Ok Maryse, I just finished this book. I honestly don’t know what to think. At first I was icked out by the 20 yr. old boy bander thing, because I have a 20 yr. old son. Then as I was reading along, I’m like this could work. This guy really loves her and she loves him. It’s so genuine and real. GAH! Then real life gets in the way with her daughter. I was actually cursing that kid for getting in the way of her Mom finally finding love. Then, I was like that could be your kid, how would you feel?! I just have to throw my hands up and shake my head. The ending came so fast and abrupt. I kept tapping my iPad until it was at the end-end and still kept tapping! That couldn’t be it! But it was! WHAH!! This author better be writing a sequel to this. I’m in bad shape here. This can’t be the end. This relationship cannot be left like this. I think I’m crying as much as Hayes did. Okay….I’m slinking off to bed now…sadly. YAYYYY! I LOVE THIS BOOK!! So glad you read it!!! I hope that there is a book 2!!! Me too Christine!!!! That last quarter had my heart in my throat, and tears brimming the entire time. LOVED!!!! Omg!!!! I literally just finished this and I’m soooo angry, I feel like I invested hours and that’s how it ended.., ugh!! Lauren- I feel exactly the same way! It makes me angry to invest so much time and emotion into a book and then get to that ending. What the! I agree Maryse, that second book will heal our broken, ravaged hearts. We need to petition this author for a second book or I might have to write it myself! And we don’t want that, I’m not a writer that’s for sure.